Posted on June 1, 2018 at 6:21 am. The SOLs roll-on here at WMS — with make-up testing for all grades to take place in the library this morning. But for the rest of the school — we will be following a NORMAL class schedule today. Students who are scheduled for an “SOL make-up” should report to the library immediately following the Morning Announcements. And now for an important announcement from our school librarians. The end-of-the-year is fast approaching — and that means it’s time for ALL library books to be returned. Books can be left on the library cart outside of the cafeteria, or in the library either before or after school. The deadline to return them is next TUESDAY, June 5th. So look in your backpack, your locker, and under your bed at home — and BRING IN YOUR BOOKS! And now it’s time for WOLF PACK PRIDE! 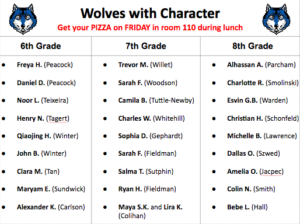 All those students who were selected for this month’s Wolves With Character Award are reminded to get to stop by room 110 during your grade-level lunch TODAY and pick up your free pizza! Here once again are the winners who demonstrated such great PERSEVERANCE all year long. In 6th grade — Freya H., Daniel D., Noor L., Henry N., Qiaojing H., John B., Clara M., Maryam E., and Alexander K.
In 7th grade — Trevor M., Sarah F., Camila B., Charles W., Sophia D., Sarah F., Salma T., Ryan H., Maya S.K., and Lira K.
And in 8th grade — Alhassan A., Charlotte R., Esvin G.B., Christian H., Michelle B., Dallas O., Amelia O., Colin N., and Bebe L.
Congratulations, wolves with character! And enjoy your pizza! Now stay tuned for a special presentation of CNN 10 on WOLF-TV! !